Ashok Bhaseen, President of Thyroid Federation International, said, “Thyroid disease is very common with an estimated 300 million currently affected and 1.6 billion people at risk of thyroid conditions globally. It is estimated that over 50% of those affected could be unaware of it.” I am looking for each and every one of them. I will not rest until I find them. I am a woman on a mission. Hypothyroid Mom Is Looking For YOU. How is it possible that there are over 150 million thyroid sufferers worldwide unaware of their condition? The majority of them suffer from hypothyroidism. What’s happened that so many fellow hypothyroidism sufferers are undiagnosed? This is so disturbing to me. Every cell of the body requires thyroid hormone for proper functioning, so every part of the body is at risk when someone suffers from abnormal thyroid levels. One look at my post 300+ Hypothyroidism Symptoms…Yes REALLY makes it clear that thyroid dysfunction has the power to destroy our health. Thyroid sufferers present to their doctors with so many health conditions. How is it possible that they are not being noticed? Are they walking into their doctor’s office with common thyroid symptoms, but their symptoms are misdiagnosed for other conditions? Are they mistaken for hypochondriacs with symptoms all in their head? Do they suffer from overwhelming fatigue, and mistakenly thought to be lazy? Do they suffer from frequent infections, and regularly prescribed antibiotics for infections such as bronchitis, sinus infections, ear infections, throat infections? Do they suffer from insomnia and sleep apnea, and passed prescriptions for sleep medication and visits to sleep clinics? Do they struggle with weight issues and swelling, and told to just eat less and exercise more? Do they suffer from poor oral health including many cavities, gum disease, receding gums, bad breath, bleeding gums and TMJ, and sent to a dentist? Do they suffer from eye problems including double vision, dry eyes, blurred vision, eye tics, spasms of the eyelid, senstivity to light, cataracts, and sent to the eye specialist? Do they have issues with their ears including ringing in ears, deafness, and excess earwax, and sent to an ear, nose and throat specialist? Do they suffer from hair loss and premature gray hair, and recommended hair loss tonics and a visit to the hair salon? Do they suffer from dry itchy skin and skin conditions including eczema, rashes, acne, and hives, and sent to a dermatologist? Do they suffer from chronic pain including headaches, painful feet, aching bones and muscles and fibromyalgia, and sent to a podiatrist or pain specialist? Do they suffer from digestive issues including constipation, hemorrhoids, irritable bowel syndrome, flatulence, acid reflux, excessive belching, and sent to a gastroenterologist or recommended to visit the pharmacy with a huge shelf of digestive aids? Have they landed in mental health wards with bipolar, depression, hallucinations, addictions, delusions, phobias, suicidal thoughts, or other mental disorders, and prescribed psychotropic drugs and therapy? Are they new mothers struggling with fatigue, weight gain and depression, and diagnosed with postpartum depression? Do they suffer from infertility or recurrent miscarriages, and sent to a fertility clinic? Do they suffer from pregnancy complications including gestational diabetes, pre-eclampsia, maternal anemia, placental abruption, premature birth, or postpartum hemorrghage, and monitored by an ob/gyn? Do they give birth to children with conditions including autism, intellectual deficits, and ADD/ADHD, and doctors miss the connection? Do they struggle postpartum with low breast milk, extreme fatigue, and weight gain, and referred to a lactation consultant or told it’s normal to be stressed with a new baby? Do they have irregular menstrual periods, constant bleeding, endometriosis, ovarian fibroids, or PCOS, and referred to an ob/gyn? Do they land in the emergency room with painful kidney stones or gallstones, and the ER doctor is perplexed why these stones have developed? Do they suffer from chronic bronchitis, pneumonia, and emphysema, and the doctor can’t figure out the cause of the recurrent infections? Do they have numbness and tingling in their legs, arms or face, and doctors can’t figure out the cause? Do they have fainting episodes, dizziness, vertigo, and no cause has been determined? Do they struggle with brain fog, and told it’s a normal part of aging? Do they have anxiety and panic attacks, and passed anxiety medications? Do they have high cholesterol levels, and passed a prescription for statin drugs? Do they have high blood pressure, and put on blood pressure medication? Do they have abnormal heart rate, and sent to a cardiologist? Have they suffered a heart attack or stroke, and regularly monitored by a cardiologist? Have they been diagnosed with diabetes, and prescribed medications? Do they suffer from autoimmune diseases such as Sjögren’s syndrome, MS, vitiligo, psoriasis, PCOS, alopecia, Celiac disease, or Cushing’s Disease, and sent to various specialists? This is not to suggest that the referrals to specialists, prescriptions and treatments mentioned are not necessary and helpful. Not all symptoms are thyroid related. However given that thyroid disease can come with so many different symptoms, one important question still remains. Was their thyroid ever FULLY tested? How is it possible that so many treated thyroid sufferers are flocking to the internet in search of answers? Why are they still suffering thyroid symptoms when they are being treated? What is going on? In mainstream medicine, TSH (thyroid stimulating hormone) is the gold standard for the diagnosis and treatment of thyroid dysfunction. The problem is that this one blood test does not give a complete picture. Many thyroid sufferers have “normal” TSH but they still suffer debilitating symptoms. A full thyroid panel should at least include TSH, Free T4, Free T3, Reverse T3 and thyroid antibodies, however all these tests are often NOT done by mainstream doctors. The second major issue is that Levothyroxine is the most commonly prescribed thyroid hormone replacement drug for hypothyroidism. While these drugs work for some, they don’t work for all. For many hypothyroidism sufferers, our bodies fail to convert properly the T4 in these drugs to the active T3 our bodies need and we are left suffering symptoms. If you are being treated with thyroid hormone replacement medication but you still don’t feel well, insist on further exploration. If you are still not feeling well, get a second opinion, a third opinion, even ten medical opinions until you find a doctor who explores the different drug options including T3 and natural desiccated thyroid to find what’s right for YOU. Don’t settle. My life changed when I found a great thyroid doctor. I hope the same for all of you – 30 online resources to find a good thyroid doctor. Is this happening to YOU right now? Or someone you know? You or someone you know may have an undiagnosed or insufficiently treated thyroid condition and have no idea. January is Thyroid Awareness Month. 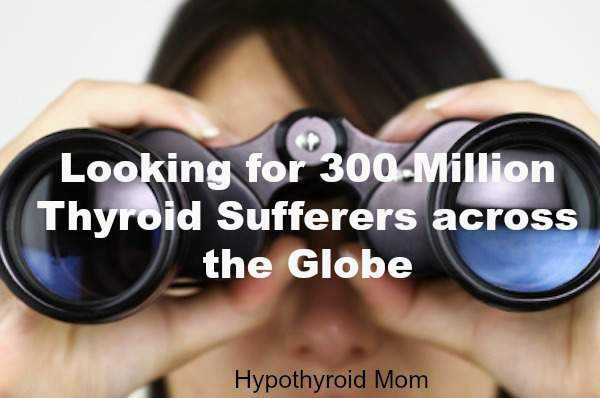 I am looking for the 300 million thyroid sufferers across the globe and I won’t stop until I find them all. HI Dana, I am desperately looking for answers. I am 38 years old and have 4 children. I have always had a weight problem and struggled with depression and always felt different. I just thought it was me. I am starting to remember things and slowly putting things together. About 7 years ago I was pregnant with my 3rd child and they noticed my blood work I had thyroid issues. So I went to an endocrinologist and they just started monitoring my blood work. They said I was hyperthyroid. I had signs of both hypo and hyper. My heart was racing, sluggish, my carpal tunnel was painful, I started not being able to breath, wheezing and coughing all night. My gp said I have asthma and gerd. What the heck! So I had an inhaler and it helped. So after I had my son they monitored my blood work and then I stopped seeing anyone, it was a waste of time and money to monitor. So fastforward a couple years, I was pregnant with my 4th child and they started monitoring me again. Same symptoms, heart racing, tired super dry skin, still coughing when exercising, depressed, anxiety, the list goes on. So after I had my 4th baby I stopped going to any doctor I just felt like they were not listening to me. So fastforward 2 years, which was last year I was choking and couldn’t breathe so I went to same endo doc and seen a new doc at same practice becuz other doc retired. They nodules and I was hyperthyroid, so they did a biopsy, it was neg for any cancer. I did RAI treatment and they said I would prob turn hypothyroid. During this time I became more depressed and anxious and gained over 30 lbs. Endo doc just kept monitoring my blood work, As of Sept of 2016 my tsh 1.66 and t4 .79. I cried to the docs fill in cnp and she said maybe a diet pill? I dont want a diet pill, something is wrong with me!!!! Please help me!!! So here I am now in the present still up over 30 lbs feeling more like crap, still depressed, tons of other things going on but no help and no answers. I am coughing more than ever and my thyroid ultrasound I still have nodules. I know I am leaving out things just can’t remember. I have not breast fed in almost 3 years and still have a little breastmilk or something that leaks. I do have quite a bit of stress from my husband, financial and having 4 young children. I just want to feel better! I want to go back to work in the next year when my last baby goes to kindergarten but I feel like I am incompetent to work feeling this way. Please help me!!!!!!!!!! !